From only £1.50 per licence when ordering 250+ copies! Develop your students' confidence in scientific literacy and their ability to express scientific ideas clearly. 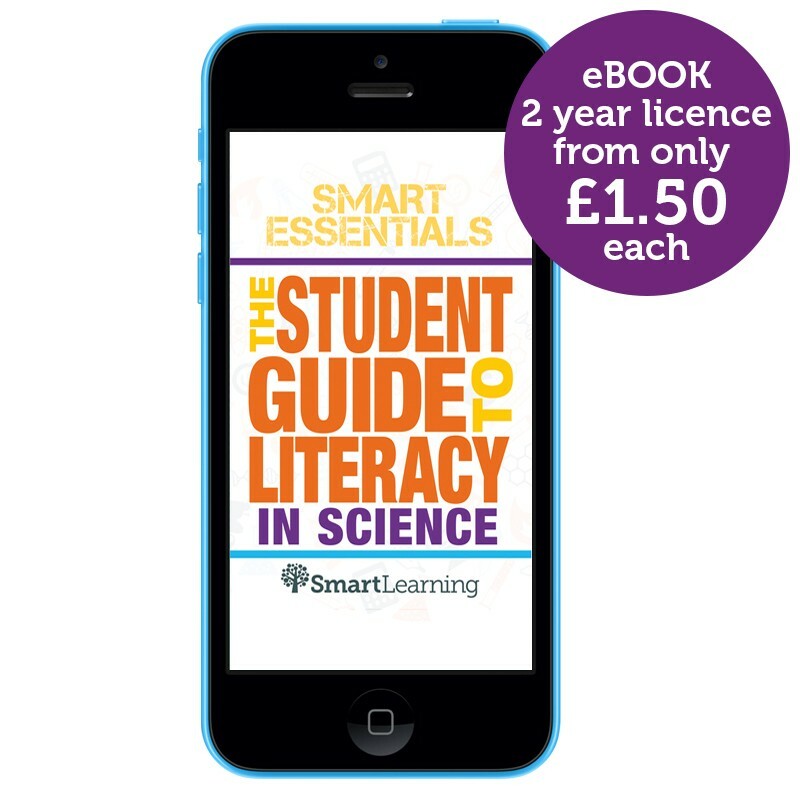 The Student Guide to Literacy in Science is the exciting new addition to our Smart Essentials range which questions and answers what it means to be scientifically literate. This handy guide will provide support to both students and teachers to help ensure a clear scientific literacy strategy is implemented across the sciences. The unique, pocket-sized reference guide will help build and develop scientific literacy skills in your pupils, giving them the tools to express clear scientific ideas and explanations. *Please note: It can take up to 2 business days to issue log-in details for Smart Learning eBooks. For further help have a look at our video tutorials. If you cannot find the answer to your question, please contact us at 01423 206 200 or via admin@smart-learning.co.uk. When downloaded, you need to use your login details to download your eBook. First you will need to download the free Smart Learning App – details can be found at: http://www.smart-learning.co.uk/ebookapp. You will need to download the app onto every device that you want to use the eBook on. Once the app is installed, login using the details provided. Please note that each student will have a different login. As these logins are automatically generated, you may want to record which login has been assigned to which student. Any information added using this login (notes, highlights etc) will be automatically synced with any other device. Have you typed your username and password correctly, including lower case and any punctuation? Consult the login documentation supplied in your confirmation e-mail. As the logins are generic, you may find it useful to record which login has been assigned to which student. Why should I assign licences to individual students? Although the logins are generic, the features of the eBook, notes, bookmarking and highlights mean that there is a real benefit to assigning logins to individual students. It is probably worth considering this when purchasing licences, so that they follow a student through their school year. The eBook app is free to download, but to gain access to the eBook you will need to contact Smart Learning and subscribe to that book. You can subscribe to multiple books with login details for each class to meet the needs of your cohort. How long is the subscription for and how much will it cost? 1, 2 and 3 year licences are available, per user, and offers are often available when purchasing with other course components. Subject to your statutory rights (including your rights under the Consumer Contracts (Information, Cancellation and Additional Charges) Regulations 2013 ("Consumer Contracts Regulations") implementing the Consumer Rights Directive 2011/83/EU), Monthly subscriptions have a minimum subscription period of three months. Should you wish to cancel, please contact us at 01423 206 200 or via admin@smart-learning.co.uk. How do I purchase a subscription for a different child? It is recommended that you buy a new subscription for a new student so that they can benefit from the personalised features the eBook offers. Will it be a safe environment for my children to be in? Smart Learning eBooks contain only published content and the app does not allow access external websites. Any personalised data is synced to a secure server so that it can be accessed on multiple devices. This data is not accessed by Smart Learning. Will my children's identities be protected? We supply a list of generic logins for your school to use to ensure that we do not store student credentials. Which devices and internet browsers should I use? Do I need any software installed to use my eBook? 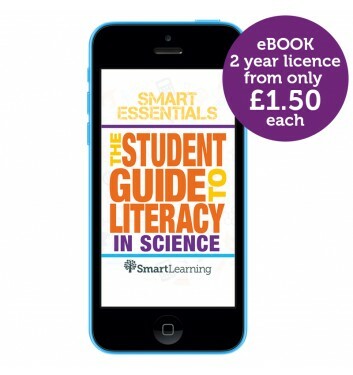 To access your eBook, you will need to download the free app – details can be found at: http://www.smart-learning.co.uk/ebookapp. How quickly will my eBook download? A larger book, like Smart Science, will take around 2-3 minutes on a slow broadband connection, and less than 10 seconds on a fast (fibre) connection. A smaller book, like The Student Guide to Literacy will take less than 10 seconds on a slow broadband connection, and less than a second on a fast one. However, the app is designed so that you can start using the eBook before the download is complete. Single copies of the printed Student Guide to Literacy in Science can be ordered on approval by UK schools. Interested in the Student Guide to Literacy in Science? Why not download a sample page and see for yourself! If you would like to take advantage of any of these offers please call us on now 01423 206200 or email admin@smart-learning.co.uk.